Clubs Reviews : Longer, Louder, Larger – Lush! Classical 2017 Is On! October 2016 saw one of the most spectacular dance events ever held in Northern Ireland. A phenomenal, first-of-its-kind event featuring a 60-piece classical orchestra, world-renowned DJs and live vocalists playing floor fillers from the past 20 years all produced in conjunction with Kylie Minogue's musical director. The result was simply out of this world. A sell-out gig with over 5,000 people brought together, in an electric atmosphere dancing the night away to songs like For An Angel, Insomnia and Such A Good Feeling. Col Hamilton, co-founder of Lush explains: "Lush! 20 was the most phenomenal event I have ever had the pleasure of organising in my 30 year career. The feedback was simply out of this world. "We had people fly in from all over the UK and even Europe for the event and have been inundated with requests to do it again ever since. This was meant to be a one-off show to celebrate the 20th anniversary of Lush! Nightclub – a true institution in Northern Ireland. But it was so incredibly successful in every sense of the word that we just had to do it again. We have had enquiries about taking the entire show on tour – to the UK and even Ibiza!" "Lush 2017 will be even more spectacular. After selling out in advance this year we have listened to demand and taken the entire SSE Arena – seated and standing, equating to a further 4,000 tickets. We will have a bigger sound system, longer sets and of course, more staff on the bars! "And to top it off, we just signed world-renowned DJ legend, Paul Oakenfold as special guest DJ." Lush! classical will once again be produced by Brothers In Rhythm, the duo consisting of Kylie Minogue's musical director, Steve Anderson and top international DJ, Dave Seaman alongside Lush! co-founder Col Hamilton, whilst the musical scores will be written by Cliff Masterson, composer, orchestrator and string arranger who works with such artists including Little Mix as Emeli Sandé. Organsiers have also confirmed that there will also be extra Golden Circle tickets available, which come complete with VIP bar access. Col Hamilton continued: "I would like to thank everyone who has been involved in this game-changing classical club event in Northern Ireland and urge people to get their tickets soon as we are expecting another sell-out show." 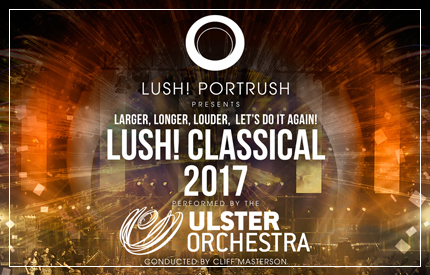 Fiona McDonnell, Director of Concerts and Artistic Planning of the Ulster Orchestra also said: "The Ulster Orchestra are delighted to collaborate with Lush! Classical once again. "Our musicians enjoyed every single beat of the performance in October and the reception they received from the arena was simply amazing. - an incredible experience! "Dance Music is now firmly established on our ever expanding playlist and we cannot wait to get back on the stage again next year with Col Hamilton and his brilliant team." Paul Oakenfold commented: "I am honoured to be asked to play at what sounds like the most epic of events. "I have played Lush! many times and think the crowd is fantastic – the Northern Irish people know how to enjoy themselves. Paul concluded: "I am genuinely excited by the creative mix of musicians involved in this project, and I know this event will be something truly spectacular." Tickets for Lush! Classical 2017 performed by the Ulster Orchestra, are on sale now.